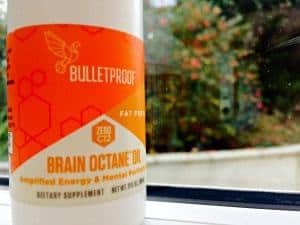 I wanted to share my experience and review on using two products from the Bulletproof.com range. These were the travel size Brain Octane oil bottle and the Brain Octane softgels supplement bottle. I did a monster travel trip where I ended up being on 14 planes in 17 days as I travelled from the UK to Dubai, Singapore, Australia and Thailand and then back again to the UK. This was a perfect time to try out how to try be on a ketogenic diet when being away from home and going through so many international airports, being on the road in different cities and hotels and of course having to eat out in restaurants and cafe/coffee shop spots. Well the most important question is will airport security take my precious keto oil away from me? The answer is no they won’t. This is my experience in every international airport that I have been through which includes: UK (Liverpool, Manchester, Gatwick and Heathrow), US (LAX in Los Angeles), Dubai, Singapore (Changi), Thailand (Bangkok and Chiang Mai), Australia (Sydney, Melbourne, Adelaide and Cairns) and South Africa (Cape Town and OR Tambo in Johannesburg). The rule is if you want to carry liquids onto the plane as hand luggage and not put it in your checked-in hold luggage then it has to be 100ml (3.4oz) and below. Both the USA transportation security administration (TSA) and UK government say similar things on their websites on recommendations when travelling with liquids through an airport. Make sure this is in a bottle saying what the liquid is inside the bottle and how many millilitres or ounces it can contain. Security are not there to smile and be happy I have found. They are trying to get as many people through a security screen without missing a security risk. They will quiz you on the contents of your carry on bag or handbag. Having the bottle say what it is and how much it holds means your life is easier if questioned at all. The bottle with the liquid must also be in a clear, see-through plastic bag that is sealable all the way. The TSA say it must be in a 1 quart size resealable bag, whilst the UK say the transparent bag must be about 20cm x 20cm. So this would be like a clear sandwich bag or plastic ziploc bag or one of these approved clear travel bags on Amazon. I had my little bottle of “fat for fuel” in one of these clear bags in my laptop satchel bag. I then took out the clear plastic bag with my travel size bottle in it and put the bag on the tray to go through the scanner. Not once did I have an issue at any of the airports I went through. The Bulletproof Brain Octane Oil travel bottle is 3 fluid oz (90ml) in size so it passes the liquids regulation no problem. The recommended serving is 15ml, which is 1 tablespoon. This means one bottle will give you 6 servings. Depending how much MCT oil you like in your Bulletproof coffee depends how long into a trip it will last. The bottle is reusable which means instead of buying a new one each trip you could refill it from you bigger bottle of oil. 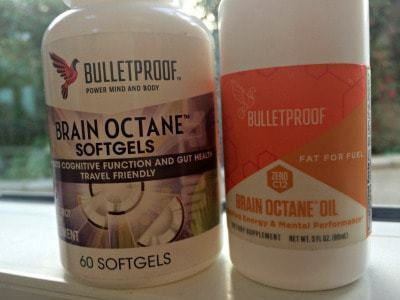 You also could use the Bulletproof XCT oil when you refill if you really wanted to that’s if you prefer XCT over Brain Octane. Apart of my keto travel kit were these handy MCT oil supplements. 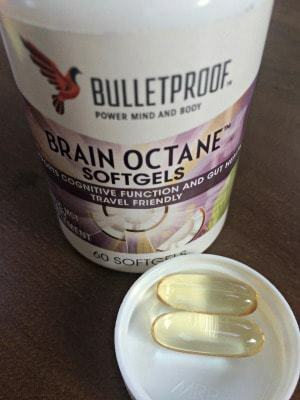 At first when I came across this Bulletproof Brain Octane supplement at the Bulletproof Conference in Pasadena, CA I did think: “Why would someone buy these instead of a getting a bottle of oil?”. After travelling such a long distance and being away from my normal routine I can see one of the benefits. I found I was glad I could take 2-4 of these softgel oil capsules in a day to top up my ketones on demand. Since they are made with the same C8 caprylic acid as the regular bottles means you get access to those fast acting ketones in a capsule. I ended up using them mainly before bed. I like to take Magnesium L-Threonate to help assist my nervous system, aid sleep and prevent muscle cramps on a low carb diet. It is recommended to take a magnesium supplement with food or some fat. The Dr Mercola range of L-Threonate that I use are in a MCT and magnesium mix already. There is no harm in boosting my ketone production with a bit more supercharged medium chain triglycerides is how I feel. Especially when my body is under travel stress anyway. In each softgel capsule is meant to be 1000mg of Brain Octane Oil. The bottle recommends taking 2 a day or up to 4 for brain performance. There are 60 softgels in a bottle so depending on how many you are planning to take each day on your work trip or holiday break you need to make sure you have enough supply. I did keep these ones in my checked-in hold luggage as I wasn’t quite sure how these are treated by airport security. I thought better safe than sorry to avoid the risk of them being taken away from me. Nutritional ketosis is the end goal when taking a refined coconut oil like MCT oil. I’m going to expand this more but I wanted to quickly go over what I know so far. Coconut oil is a great saturated fat. It has been linked to many health benefits and been used for cooking and adding to food for a very long time. Coconut oil is made up of medium chain saturated fats caprylic acid or oroctanoic acid, capric acid or ordecanoic acid and lauric acid. It also has long chain saturated fats. MCT oils are refined coconut oil. It is not the same as extra virgin coconut oil either. The coconut oil under goes a process to remove the long chain fatty acids and try keep only the medium chain fatty acids. This process to refine coconut oil down to capric and caprylic acid is known as fractionated coconut oil. Fractionated coconut oil is made by using steam and pressure hydrolysis of coconut oil. The first step is to break down coconut oil into glycerol and free fatty acids. The fatty acids are then separated (fractionated) into the long and medium-chain fatty acids before medium-chain acids are added with the glycerol to create MCT oil. The lauric acid is removed from fractionated coconut oil so you are left with mainly capric and caprylic acid instead. So not only is the difference between different MCT oil brands where they source the oil if it is pure coconut oil or palm kernel oil mix but also how well the fractionate the oil into the different medium chain fatty acids. Brain octane oil is made to have a very high concentration of the caprylic acid (C8) branch compared to regular MCT oils. 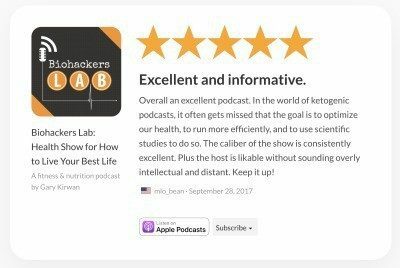 I heard Dr Dominic D’Agostino, a ketogenic diet researcher, say in a podcast with Tim Ferris how from his self-experimentation test results and observing in others too how a pure C8 oil is one of the best ways to get into nutritional ketosis using an exogenous keto supplement. More to come on these cool exogenous ketone supplements in a later article. You get different variations of a keto diet with a popular one being to use MCT oils for ketosis. I thought well if it is good for our brain and central nervous system then I’d like to try some of that even as an adult. I personally tried this and lost 15 kg in about 8 months without trying to eat less. Read my Bulletproof coffee review and personal experience here. So yes, a keto diet helps you lose weight. 4.1 What is Fractionated Coconut Oil?